Although the core of the band has been together since the early part of the decade, newly released, Crust Of Ego is the first CD by Hungarian newcomers Ad Astra. This band obviously took their time honing their sound and their patience and persistence has paid off big time. In all honesty, I have to say that it has been quite some time since I've been blown away by a band's debut as I was with this album. According to its website, Ad Astra calls their music progressive thrash. While that might be the best way to describe their music, that tag is just too limiting. Those might be the main building blocks of these compositions but touches of - traditional metal, power metal, NWOBHM, metalcore, death, stoner, and just about every other type of metal and hard rock - can be detected throughout 'Crust Of Ego.' (In case the references to death and metalcore scared you, you can rest easy; the vocals are all clean and done very well.) 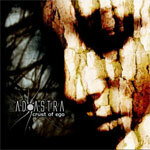 It's tough to find bands out there for which to compare Ad Astra. Control Denied is certainly one that comes to mind, along with the lesser known Gracepoint and Forte. This disc has been stuck in my player for over a week now. With such great songwriting, musicianship, and production, I just can't get enough of it. I'm not going into a blow by blow description of each song. You'll need to sniff this one out and check it out for yourself. Trust me; you'll be glad that you did. This could be the start of something special. This disc has been stuck in my player for over a week now. With such great songwriting, musicianship, and production, I just can't get enough of it. This could be the start of something special.